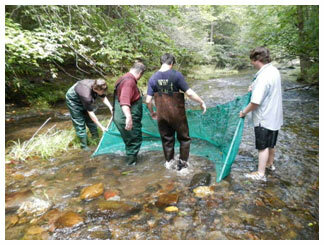 Loyola University New Orleans students enrolled in a Biology of Fishes class started the fall semester gaining real skills through exposure to fish habitats in the Cherokee National Forest in Tennessee. The area is home to the Conasauga River, a biodiversity hotspot boasting some of the greatest diversity of fishes in North America. The students spent the Labor Day holiday weekend actively learning how to identify fishes, how to master different fish sampling methods, and how to measure stream habitat and water flow—all valuable skills for careers in fisheries biology, environmental science, aquatic resource management and related fields. “This trip allowed us to be hands-on, which really let us gain the skill sets we need. I absolutely would rather learn in the field than the classroom because it makes more of a lasting impression when you are actually experiencing what you are learning,” said Loyola junior Mallory Hirschler. The learning experience was definitely not a typical biology class. The students, who camped in the national forest, also went whitewater rafting on the Ocoee River, hiked on trails near the Hiwassee River and toured the Tennessee Aquarium in Chattanooga. Loyola’s biology department regularly provides exciting, educational and transformative field experiences for both majors and non-majors.